A handbook aimed at providing teachers with a practical guide to teaching the Lingua Franca Core which is perhaps more useful as an exploration of the arguments for and against the model. The lack of agreement among linguists and teachers over the necessity for ELF is reflected in the structure of the book itself, as the first half is almost entirely given over to explanations of, and justifications for, ELF. These sections are very well written, and explain the case for ELF in a cool-headed and accessible way. In brief, the argument runs as follows: English now has more non-native than native speakers, and analysis of non-native speaker interactions reveals certain recurrent patterns of grammar, pronunciation and usage that are reasonably stable among speakers from various language groups. These patterns can be analyzed, collected and generalized into what is termed the Lingua Franca Core (LFC); forming the basis of a new, globalized variety of English. 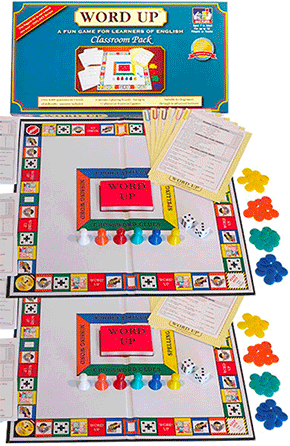 The benefits of ELF are that it is democratic rather than being dictated by native speakers, and that it concordantly exorcises the spectre of cultural imperialism which has often been perceived as lurking in the shadows of the ELT industry, gleefully rubbing its hands and cackling. These arguments are hotly disputed, and while many are sympathetic to the political concerns, others are not. Perhaps anticipating this, Walker puts forward another argument for EFL adoption which is more generally appreciable and relevant to his case concerning pronunciation – that of intelligibility. Walker argues that the features identified in the LFC make the language spoken by learners easier to understand to the majority of English speakers (both native and non-native). This is in contrast to the areas usually focused on by teachers (weak forms, connected speech, schwa, etc. ), which actually reduce the intelligibility of learner speech, rather than increasing it. The evidence for this view is clearly laid out in the book, and Walker makes a strong case for why ELF pronunciation teaching is the most parsimonious and potentially effective approach to take. For most people this argument is likely to be more persuasive than others due to its practical concerns and applications, as opposed to the more subjective and ideological arguments presented for ELF as a whole. As well as laying out a positive case for ELF in general and ELF pronunciation in particular, Walker also addresses the negative case against ELF in the form of a list of ten concerns, each carefully considered and rejected, and a complementary list of six benefits (some of which I have already discussed – for the rest you’ll have to read the book.) A major strength of the book is the persuasive and accommodating approach taken in building its argument. 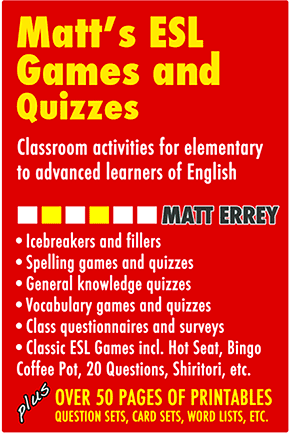 Having established its case for ELF and the LFC, the book goes on to provide teaching advice and techniques related to ELF pronunciation, which, for most teachers, will be the most important part of the book. 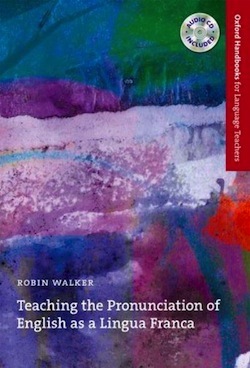 Beginning in chapter 4, Walker provides advice, techniques, and models for the teaching of ELF pronunciation. I will briefly engage in a chapter-by-chapter summary of the advice given before providing some closing comments. In chapter 4 we are told that the first step in ELF pronunciation teaching is to raise student awareness (or in other words, to convince students that it’s a good idea.) While Walker may be right that this is a necessary step, and while he makes some effort to show how classroom treatments of this topic can be brief and unobtrusive, the reader may be left wondering how many students are likely to engage fully with the sociolinguistic arguments and ramifications of what they are being taught. The chapter moves on to discuss general advice related to vowel quality, aspiration, and other aspects of pronunciation, accompanied by brief pieces of advice on how to tackle each of these in the classroom. This advice is useful, but somewhat briefly covered. In chapter 5 the book looks at a number of first language groups, and discusses how features of a learner’s L1 can both aid and obstruct their successful adoption of ELF pronunciation. A lot of useful information is provided about the contrasts and similarities between the LFC and some of the major language groups that teachers are likely to encounter. However, this may raise eyebrows among readers, as for some of the language groups the advice given appears to be more complex than that included in previous pronunciation guides with a non-ELF model, such as Learner English. It is easy to imagine a learner growing frustrated when, having been convinced of the useful applications of ELF (as recommended in Chapter 4), they then realise that this new model is actually going to require even more study to master than the native-speaker model they were expecting. Despite these concerns, the chapter provides practical approaches to considering these issues and addressing them with learners, and it could well be argued that any pronunciation model chosen is likely to be more difficult for one language group to tackle than another. Chapter 6 is given over the discussions of planning and assessment of ELF, acknowledging the practical realities and the difficulties of attempting to implement an ELF approach in certain environments, while also making suggestions about how this can be achieved. Finally, Walker provides some guidelines pertaining to effective EFL pronunciation assessment, alongside fairly convincing justifications. In conclusion, Teaching the Pronunciation of English as a Lingua Franca does an excellent job of making the case for ELF, and for ELF pronunciation in particular, focusing on the practical applications and benefits of the approach while also addressing the common concerns of ELF skeptics. The sections of the book which actually deal with the teaching of ELF are somewhat scantier, less persuasive, and instill a number of fresh concerns, as discussed above. The slightly disproportionate amount of time spent by the author on mounting a case for ELF, when contrasted with the comparatively brief and thin treatment of how it can be taught may leave the reader wondering if the book is not a little premature, and whether ELF is, for now at least, still at a stage of discussion and justification, rather than of implementation. Ultimately, the book may leave those looking for practical advice in the teaching of ELF feeling dissatisfied, but it serves as an excellent introduction to the arguments, and will certainly be appreciated by those engaging with the ongoing ELF debate.